Mother’s Day is essentially a chaste day to offer to mothers and mother figures throughout the world heart-felt applaud and admiration for their ubiquity in human life. It is a yearly worldwide commemoration, held at different dates of the calendar depending on the country—however the most popular date being the second Sunday of the month of May. India too entitles this particular date as the pious day for extolling mothers. Prior Mother's Day celebrations dates back to the ancient Greek civilization’s custom of celebrating the season of Spring for glorifying Goddess Rhea, the Mother of Gods. In traditional Britain, “Mothering Sunday” was a clerical day which necessitated people to visit the church for getting baptized. At modern times, however, this day has been dyed with the chromaticity of the commemorations of Mother’s Day. The nascence of the trend of contemporary venerations of Mother's Day is primarily accredited to two women - Julia Ward Howe and Anna Jarvis, who played cardinal roles in founding the protocol of honoring man’s soul-nurturers - Mothers, on a particular day in the United States. At about 1870, Julia Ward Howe became vocal for the commemoration of Mother's Day every year. It continued to be held in Boston for about 10 years under her patronage, but withered away along with time. Other records claim that, during the late 1800s, Juliet Calhoun Blakely initiated Mother’s Day in Albion, Michigan. Her sons paid homage to her each year and urged others to exalt their mothers too. The first noteworthy celebration of Mother’s Day got held in 1908 when Anna Jarvis held a memorial for her mother at St Andrew's Methodist Church in Grafton, West Virginia. The memorial service was attended by 407 children and their mothers. Anna Jarvis’s dream was to proceed with the work of her mother, who founded the Mother’s Day Work Clubs to stress on public health issues and to mark a particular day for eulogizing all mothers of the world, as her belief was mothers are "the person who has done more for you than anyone in the world". A Mother’s Day International Association got established in 1912 to popularize the holiday in other countries. Mother’s Day has gained increasing attention from that time. There are distinctive maneuvers to express affection and gratitude to mothers and mother figures on Mother’s Day. They encompass white carnations, which Anna Jarvis desired to be made the official sign for the day, as well as the International Mother’s Day Shrine, located at St Andrew's Methodist Church in Grafton, West Virginia and dedicated to the preservation, enrichment and melioration of the fervor of motherhood. Roman Catholic Church relates Mother’s Day with the ritual of offering prayer to the Virgin Mary. In Hinduism, Mother's Day is famed "Mata Tirtha Aunshi" or "Mother Pilgrimage Fortnight", and is celebrated in countries with a Hindu population, especially in Nepal. The holiday is observed on the new moon day in the month of “Baisakh”, i.e., April/May. This veneration is based on Hindu religion and it precedes the States-inspired celebration by at least a few centuries. The modern Mother's Day has been merged into Indian culture, and it is celebrated every year on the second Sunday of May, not as a holy event, but as an informal commemoration. The day is to elate mothers with all the pamper and approbation and to fill their hands with enthralling gifts. Don’t let work chores hamper your wish of fondling your mother on the heyday and choose the cyber porches to nuzzle the core of your mother with your heart-rendered love for her. 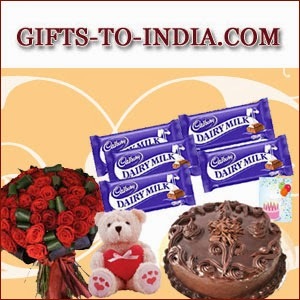 Send Mother’s Day Gifts to India by the e-shopping zones and glut the alma of your mother with jesting felicity. Avail one day, to the fullest, for making profoundly happy that individual, who cares for only for your happiness 365 days. 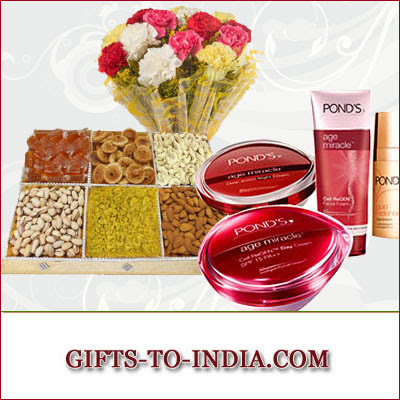 copyright © www.gifts-to-india.com. Watermark theme. Powered by Blogger.